Ada is a two player highly combinatorial super powered brawler set in sweeping cityscapes with deep controls. 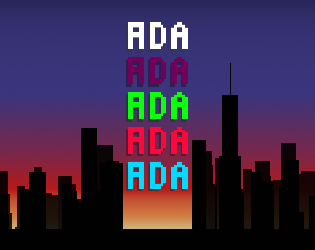 ...Ada is also an old unfinished project of mine that I don't really see me picking up again. Feel free to give it a whirl and play around in it, but I have no guarantees to either its ability to not crash or be fun. Linux Installation - go to https://www.love2d.org and install the LÖVE packages. Then execute the love file using "love Ada.love"